The notion that one’s home appliances could all be connected in some way — and respond with a simple tap, swipe or voice command — was once only a reality for the very wealthy or the very nerdy. Now, anyone with a Wi-Fi router at home can automate their appliances. That’s the world according to Alex Hawkinson, the creator of SmartThings. SmartThings sells kits, for just under $200, that include a basic router and small adhesive sensors. The sensors attach to various objects in your home and, ultimately, connect to your Wi-Fi network. You then control those appliances with the SmartThings iPhone app. 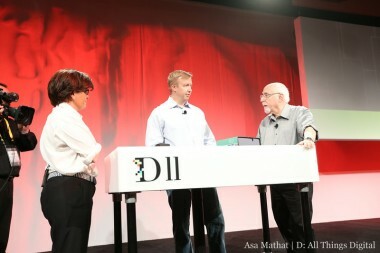 But SmartThings is more than just things; it’s a platform, one that Hawkinson believes should be as open as possible. Hawkinson appeared onstage at the D: All Things Digital conference today to give AllThingsD’s Walt Mossberg and Kara Swisher a walk-through of SmartThings and announce that the company is opening up its developer platform. First, Hawkinson said, you pick a SmartThings kit that addresses a specific problem — for example, errant leaks throughout the house, or, if you often drive away from your home and leave the garage door open behind you. The SmartThings app interface shows a grid of icons for each specific application. Tapping on each icon prompts an action. Using a stand-in wall littered with SmartThings, Hawkinson showed how tapping the app will turn lights on and off, or indicate whether a door has been opened. “You know if the cabinet door here is open or closed,” Hawkinson said. “Mom’s been drinking again,” Kara quipped. 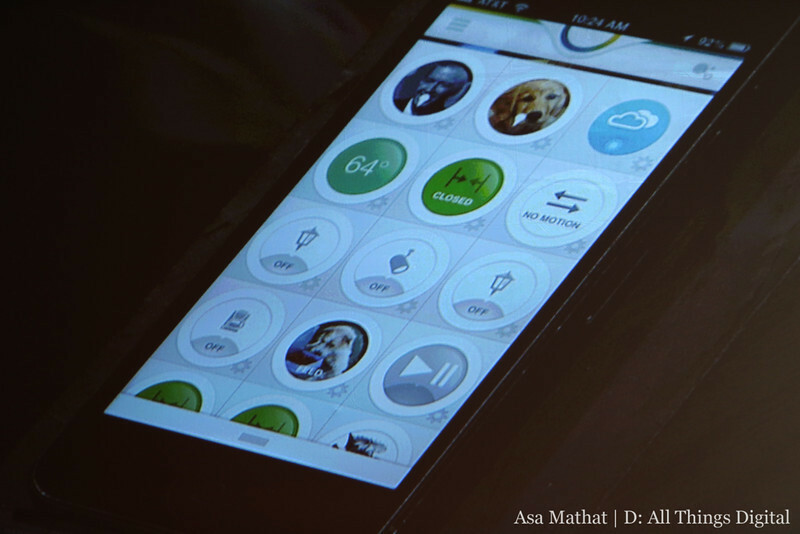 Hawkinson also showed an app within the SmartThings system, called Rise and Shine. It’s tailored to a morning wake-up routine: When you wake up, the lights turn on, the shades go up and the connected coffee pot starts to brew. Any IR remote within the home can also be programmed to perform functions. A TiVo remote can control the lights. “It’s easy, but it’s also open,” Hawkinson said. An “open platform” versus a closed one might not mean much to the consumers who are interested in SmartThings, but an open platform allows developers and inventors to create new “things” and apps that would work within the SmartThings system. The popular Nest “smart” thermostat, for example, has a closed API — application programming interface — which limits developers in terms of the types of apps they can build for it (though some have hacked it). With SmartThings, developers have more creative license. Perhaps more notably, SmartThings works with a variety of different wireless communication standards, including Bluetooth, ZigBee and Z-Wave, to work with many different home systems and devices. Eventually, Hawkinson said, he envisions SmartThings being an e-commerce platform for all kinds of devices — whether from SmartThings or other manufacturers — that will work on the SmartThings platform.